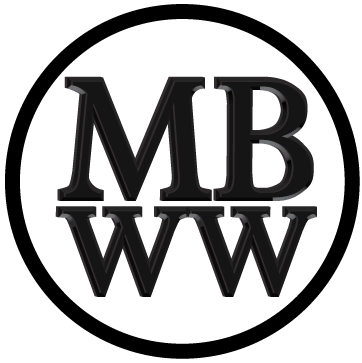 STOIC is a new microbrand, developed by Peter Speake-Marin, the original founder of Speake-Marin, a Swiss-based manufacturer known for limited edition high-end watches. Peter has started the STOIC brand with three lines of watches; Pilot, Chronograph and Sports. 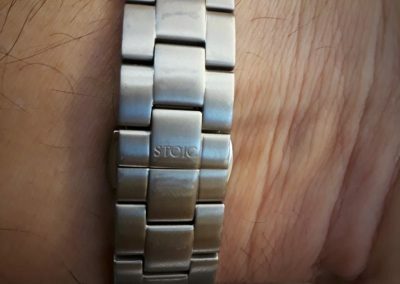 STOIC is a philosophy linked to many early philosophers including Seneca, a highly regarded Roman philosopher, playwright, author, statesman and more, that died in 65 AD by his own hand (read how and why online) and embraced the Hellenistic philosophy founded in the 3rd century BC. 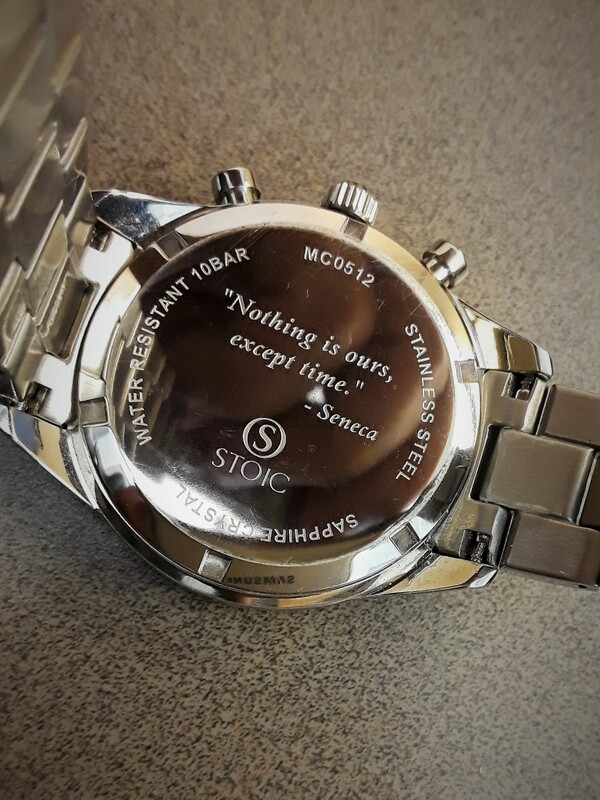 A famous quote from Seneca, “Nothing is ours, except time” is engraved on the polished stainless case back of this watch and is printed on the inside of the sapphire on the other two models case backs. 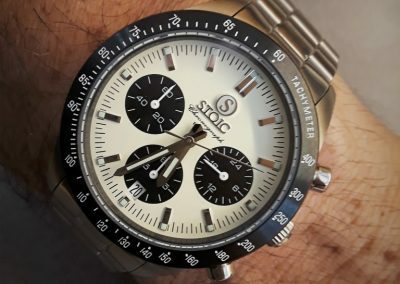 For this review I have the affordable Chronograph MC1, a Panda dial design that combines value, quality, design and attention to detail with 3, 6 and 9 o’clock subdials in the classic Panda design, black subdials and white face. 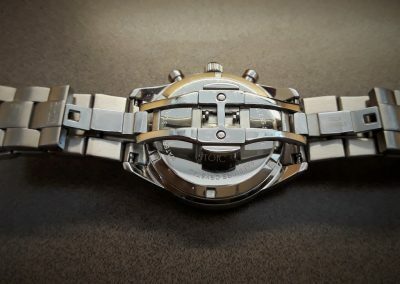 “Reverse” Panda, where the subdials are white and the dial is black is a variation that is common as well, but not in this particular watch. 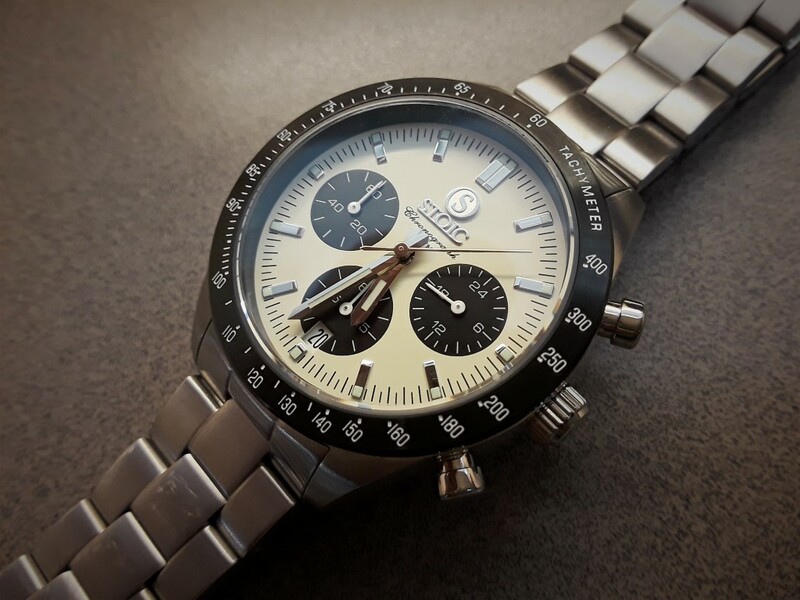 The Panda style has been used to great success beginning in the 1960’s, particularly in extremely collectable watches such as the Rolex Daytona, the Heuer Carrera and the Omega Speedmaster. The design is iconic and will likely always be desirable. 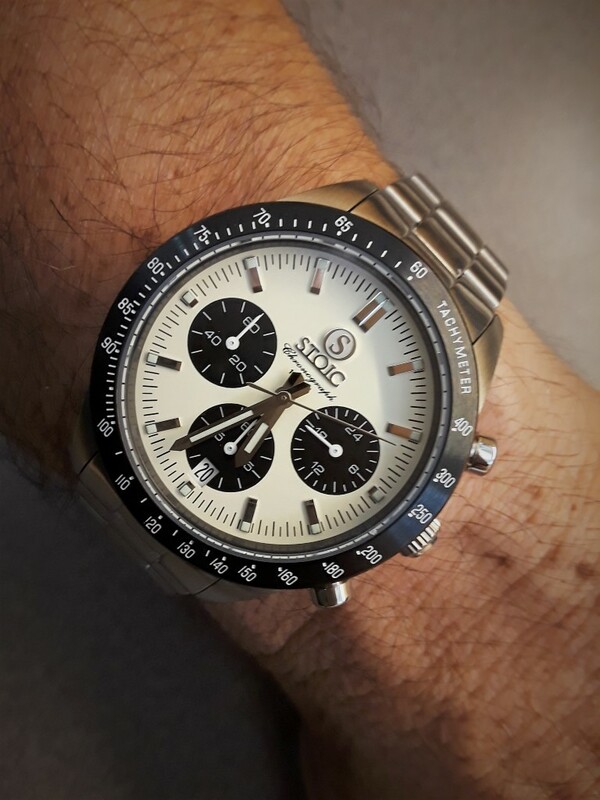 This particular watch has a white on black 3 o’clock 24 hour subdial, a 6 o’clock chronograph second subdial and a 9 o’clock chronograph cumulative minutes subdial. There are polished and lumed bevelled Rolex like hour and minute and second hands, as well as twelve rectangular bevelled and lumed hour markers of appropriate design as well. 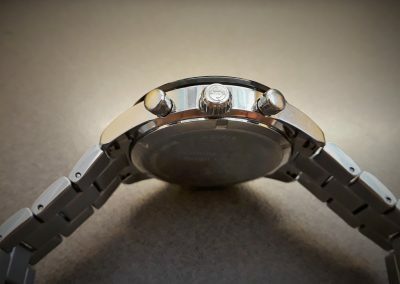 The subdial hands are like those used by Rolex except for being thinner, which is totally in proportion and design with the 38mm diameter case. The creamy white face is completely marked with second and half second markers in black, which perfectly contrast with the white markers and black faces of the subdials. A white on black PVD finished tachymeter encircles the case, similar to what a Rolex Daytona uses but proportioned correctly for this size dial. The bottom of the dial has a very nice vertically formatted black on white date window, nicely proportioned so it doesn’t interfere with anything significantly. By putting the date window at the bottom of the watch face, the watch is perfectly symmetrical. 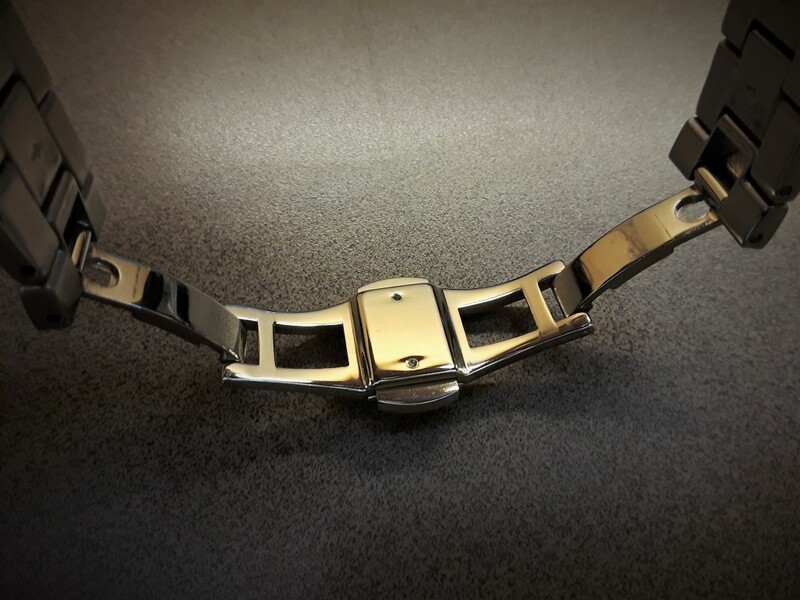 The watch is only 11.5mm thick, 45mm lug to lug, 23mm across the outer edges of the lugs, with a brushed and polished three link bracelet that tapers from 18mm to 16mm. It uses a very nice milled and chromed butterfly clasp that is tastefully signed with the STOIC name. 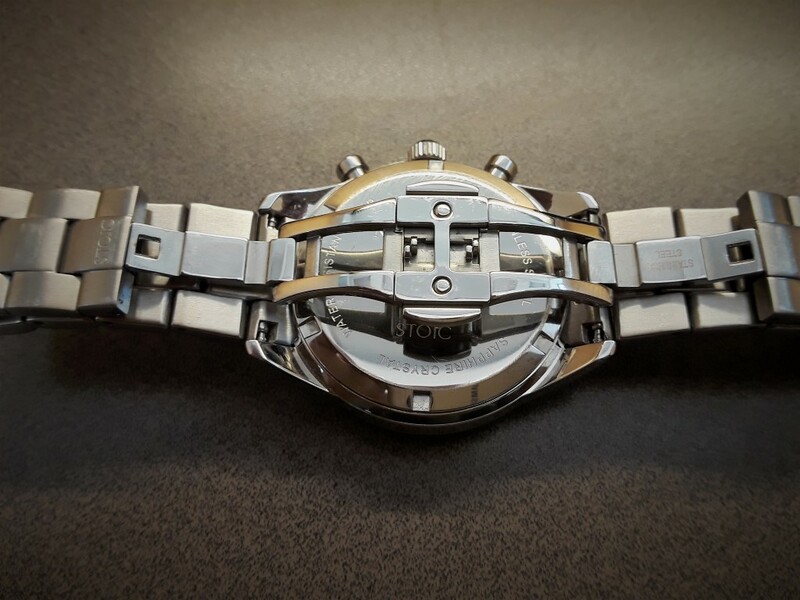 Above the raised and polished name is a matching S logo along with the printed words “Chronograph” and “10 ATM” (water resistance). The case is brushed, except for the left and right side which are nicely polished along with the two pushers and the S logo signed, gear edged, 5.5mm diameter crown. 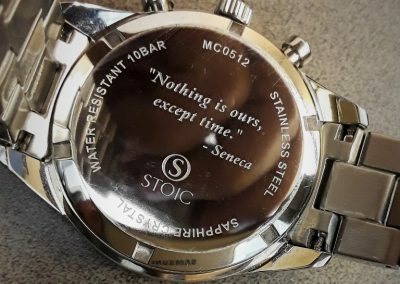 The screw down polished stainless case back is tastefully engraved with the Seneca quote as well as useful information about the watch itself. The flat, raised and bevelled sapphire crystal has three layers of A/R which give the watch face very good depth and clarity. 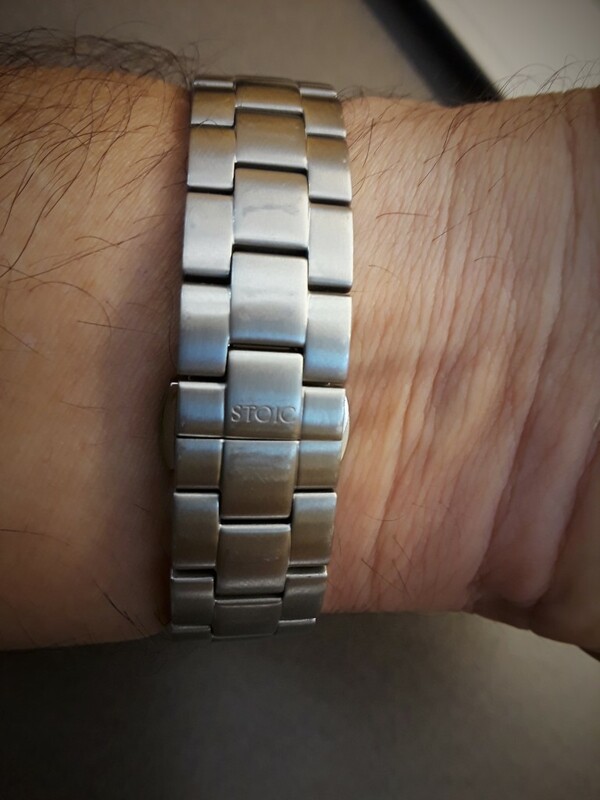 Stoic is, to the best of my knowledge, owned by Seiko and is another one of their brands. I believe it might be best to think of Speake-Martin as a spokesman for this brand. As for his contribution to design or technology of it, I would prefer to reserve judgement until I see further models.